Ram is receiving rave reviews over its revamped heavy duty Ram line up. Fans are impressed that a version of the 2019 Ram Heavy Duty truck has the ability to tow 35,100 lbs. It also has a new payload capacity of 7,680 lbs. In announcing the 2019 Ram Heavy Duty line up, Ram said that they are making the larger trucks much more like the popular Ram 1500 trucks. The 2018 Ram 1500 was just awarded North American Truck of the Year at the North American International Auto Show in Detroit. Ram is now upgrading the interiors and also now making a Sport trim package available for the larger trucks. 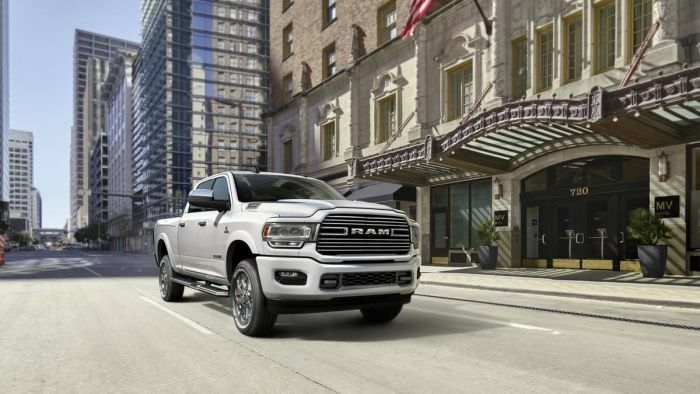 Ram announced the new packages at the New England International Auto Show in Boston. It used to be that in the larger versions of any truck line, you had few exterior options and had to take whatever was offered that suited the work you needed to accomplish. It appears those days are over, as the truck wars heat up. More and more packages are available, with a huge variety of options and exterior colors. It also shows that more and more trucks are being purchased as family vehicles and not just relegated to work sites. There are now more options for interior seating, storage and creature comforts. As an example of the greater range of options now available, the new 2019 Ram Sport packages will be available in 12 colors including Billet Silver, Patriot Blue and Diamond Black Crystal. So much for the boring work truck. The Sport package comes with body color bumpers, door handles and grille trim. The Sport package includes an all-black interior, with a black headliner and black accents. Sport trims also include the Ram’s front and rear park assist system built into the bumpers. All of the different cab and powertrain options are offered with the Sport trim. To get the Sport trim, you have to buy at least the Big Horn/Lone Star or Laramie level of 2019 Ram 2500 or 3500. While body color bumpers are nice, real truck lovers will tell you that the big draw is all about performance and capability and the new Ram 2500 and 3500 have plenty of both. The new Cummins 6.7-liter I-6, high output Turbo Diesel delivers up to 1,000 lb.-ft. of torque @ 1,800 rpm and 400 horsepower @ 2,800 rpm. Ram also did not say how much the Sport trim package will add to the cost of the 2019 Ram 2500 and 3500. Ram claims that the 2500 and 3500 have the largest amount of in-cabin storage space in the industry. The RamBox Cargo Management System includes versatile, weatherproof, lockable, illuminated and drainable storage bins built into the bed rails. New for 2019, RamBox features a 115-volt outlet with up to 400-watts of power.